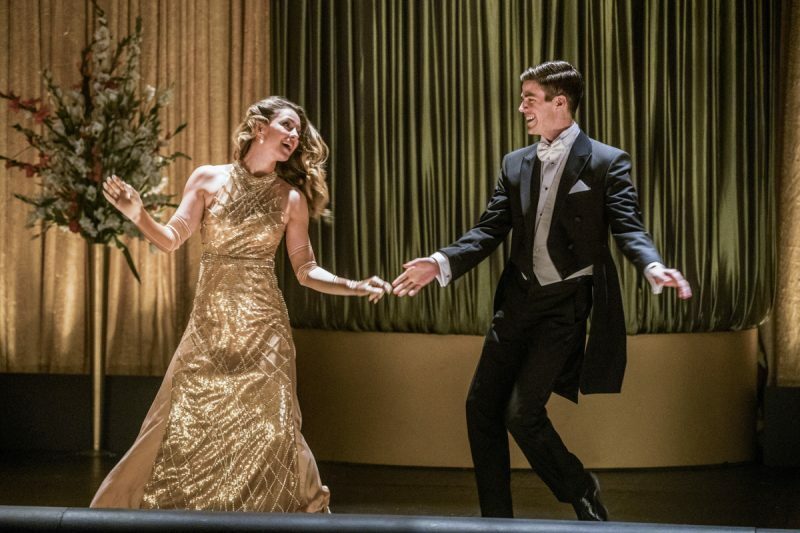 “Duet” has been hyped for weeks as a musical episode of The Flash—of course, this isn’t the first time such a thing has been attempted on a superhero network show. The gold standard remains Buffy the Vampire Slayer’s “Once More With Feeling,” an Emmy-nominated episode that was a standout in an exemplary series. I’m sad to say that the The Flash’s “Duet” doesn’t reach those rarefied heights—it doesn’t even come close, actually. But much like a group of sixth graders performing a Shakespeare play, you are charmed by their earnestness and give them points for effort nonetheless. In addition to being a musical episode, “Duet” is also a crossover between The Flash and Supergirl. For those scoring at home, it’s their third such encounter since the Supergirl series debuted two seasons ago. 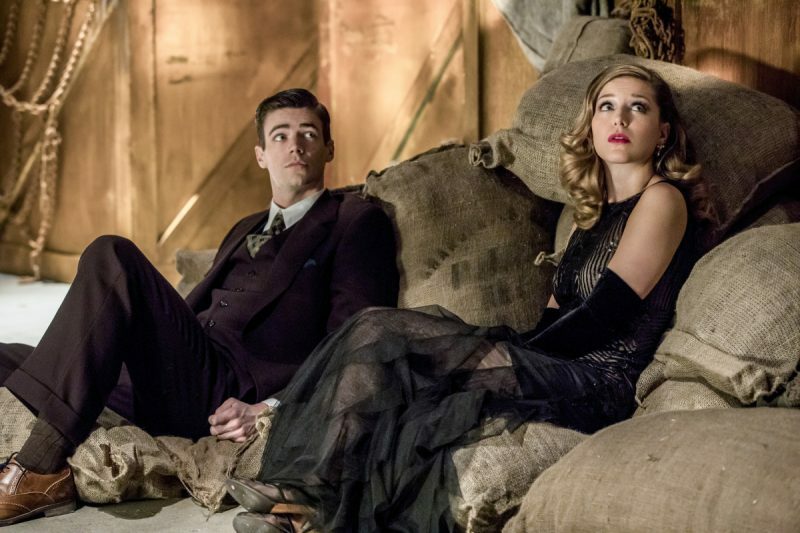 “Duet” picks up from where the last few minutes of "Star-Crossed" left off: a dapper gentleman known as the Music Meister (I know, it’s a silly name but stick with me here) is brought into DEO headquarters and puts the whammy on Supergirl, placing her in a coma-like state. Mon-El and Hank Henshaw then get the bright idea to bring a comatose Supergirl to STAR Labs because they were able to track the Music Meister to the Flash’s Earth 1. As if on cue, the Meister of Music (thought maybe that’d sound less silly, but nope) appears to toy with the Flashes, both Kid and Adult, and zap Flash into the same musical world that Supergirl is trapped in. So let’s talk a bit about the “musical” aspects of this episode. “Duet” certainly nods in the direction of several classics like Singing in the Rain, The Wizard of Oz and West Side Story, but does so in a superficial manner, as if The Flash writers had read Wikipedia entries about them the night before and was trying to find a way to cram those references in as much as possible. Moreover, the Chicago-style setting is largely a half-baked imitation of the real thing. Perhaps that isn’t fair to episode’s writers Aaron Helbing and Todd Helbing (working from a story by Flash showrunners Greg Berlanti and Andrew Kreisberg), but you’d wish they taken a page from Joss Whedon, Buffy creator and writer of the “Once More” episode. In Whedon’s episode, the songs stemmed organically from the character’s motivations and conflicts; by contrast, “Duet” features familiar crowd pleasers like “Moon River” (as sung by Melissa Benoist) and “Put A Little Love In Your Heart.” The covers of these songs range from serviceable to half decent but none are bound to make you forget the originals. Out of the episode's five musical numbers, only two were new compositions. The first was a ditty named “Super Friends,” a duet sung by Benoist and Grant Gustin (and co-written by Crazy Ex-Girlfriend star Rachel Bloom) that has a sort of corny charm, if one wanted to be charitable, but is also wince inducing at times, if one wanted to be honest. And the second was the episode's final number, "Running Home to You," written by the La La Land writing duo Benj Pasek and Justin Paul. The singing chops of the featured performers in “Duets” range from peaks to valleys in terms of quality. But to be fair, so did the singing in “Once More.” Rather than indict the weaker singers, let’s focus the praise on the more talented ones. For starters, Darren Criss as the Music Man (who don’t we just call him that from now on?) has plenty of musical theater bonafides and lends a sense of charm and bon vivant flair to his villain-of-the-week role. Even if the character ultimately turns out to be a pale clone of the Mr. Mxyzptlk that appeared in Supergirl a few weeks back, it’s nice to see a villain on The Flash who’s actually interesting for a change (Grodd excepted, of course). Also, this episode emphasizes its assets and put its experienced musical performers to the forefront. Aside from regular cast member Jesse L. Martin (Rent), the show also imports Victor Garber (Godspell) and John Barrowman (Anything Goes) from other CW Arrowverse shows to pull much of the musical weight. The scene in which the three men sing "More I Cannot Wish You," a song from the musical Guys and Dolls, is an aural highlight. Of course, it wouldn’t be an episode of The Flash if there weren’t some nagging plot and character inconsistencies (a problem that’s increasingly becoming true for Supergirl as well). For starters, it’s fairly odd that Mon-El didn’t join Kid Flash, Vibe and Martian Manhunter in taking down MM, particularly after Mon threatened to beat him up earlier in the episode. On the bright side, it’s nice to see Kid Flash get over the mental trauma he suffered last episode, particularly since I wasn’t a fan of sidelining him in the first place. That said, it was a sudden way to wrap up what initially looked to be a protracted storyline about Wally’s mental trauma. Finally, it’s clear that The Flash showrunners will use Cisco’s vibing powers indiscriminately to write themselves out of any storytelling corner they find themselves in. If Vibe was able all along to access the Music-verse Barry and Kara are trapped in, then why not just do that in the first place rather than wait for them to get shot and nearly die?! MM's capture by the three heroes seemed too conveniently easily at first but it becomes apparent that he wanted to be captured so that he could teach both Kara and Barry (and their respective paramours) about the importance of love. If that wasn’t groan inducing enough, it actually works as both heroes romantically reunite with their lovers. The development is particularly troubling in the case of Supergirl, who had every reason to be upset by Mon-El’s gaslighting and shouldn’t have been nearly as quick to take him back. It’s especially odd that this development didn’t at least happen on her own show, but rather The Flash. The Barry-Iris reunion feels a bit less contrived—probably because their break-up was more so—but to have Barry re-engaged to Iris and to have her re-accept seemed like another false step in the depiction of their relationship. Are they just fated to be a couple of romantic yo-yo’s in terms of the back-and-forth between acceptance and rejection? These reconciliations add a sour final note to what was otherwise a silly yet fun episode.